A massive storm can cause severe damage to your trees. Any hasty decision can lead to needing to remove a tree that could have otherwise been saved. Smart thinking is important to give your trees a chance of survival and prevent unnecessary removal. The cleanup process after a storm can be confusing. Our tree care experts offer a few tips to guide you through the process and help you make the right decisions. Damaged trees may often be tangled with utility lines which can be quite dangerous. It’s crucial to remain alert and keep an eye on your surroundings for downed power lines, branches that look like they may fall, and other potentially harmful environmental factors. Be careful when operating power tools or climbing equipment unless you are familiar with their safe operation. Treating a damaged tree is not worth hurting yourself, so be careful and if necessary, alert the authorities to downed utility lines. Broken branches that are still attached to the tree can be quite dangerous. Deal with them immediately, if safe, by cutting off the larger branches from the main limb or the tree trunk and pruning the smaller ones with clean cuts. It will help the tree recover quickly and prevent decay. If a tree doesn’t present an immediate hazard, take the time to analyze and figure out the best way to take care of it. Often the situation may not be as bad as it looks initially, so do not rush if you don’t have to. Bark may be gouged or ripped due to the storm. You could use a chisel or a sharp knife to mend and trim the edges, which will not only help improve the appearance but will also eliminate any hiding places for insects. Ensure that you do not remove the green part of the bark as it is vital for providing food and water to the tree. Do not be misguided into believing that cutting off all the branches or reducing their length will lead to less damage from storms in the future. According to the experienced arborists, topping off your trees could be grave for them as the stubs that tend to grow back can make them weaker. Additionally, the trees will need nutrition to recover from the effects of the storm and cutting off their branches will reduce the foliage, thereby decreasing the nourishment required for regrowth. Storm-damaged trees may look naked or unbalanced with the branches and leaves falling off, but do not be bothered by their appearance and give in the urge to over-prune them. The right storm damage cleanup can help them recover, heal, regain their beauty, and appear healthy. Sometimes a tree simply cannot be saved. For instance, if the trunk gets split during the storm, if more than 50% of its crown has been lost, or if it has already been weakened by disease, you must accept the fact that it cannot be rescued and take the required steps to remove it. Contrary to popular belief, DIY is not always the answer. If you do not know what you are doing, you may end up causing more harm to your trees. Do not take on more than your skill level allows and ask for an arborist’s help. If you are looking for a qualified arborist to help you with storm damage cleanup or tree removal after a storm, please get in touch with us at either 647-793-8903 or 1-800-407-9917. 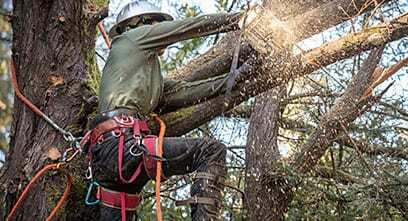 Our tree care experts at DreamWorks Tree Services will be happy to assist you. We also provide 24/7 Emergency Storm Damage Cleanup.